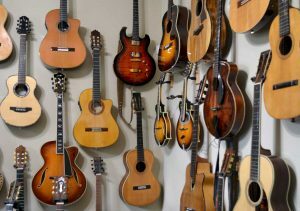 WUFT’s All Things Considered host, Dana Hill, recently spoke with Henry Lowenstein about the new exhibit at the University Gallery, Fine Arts Building B: ‘Guitar Art: Historic Innovation of an American Icon through Industrial Design, Art & Music | Guitars from the Henry Lowenstein Collection. The ‘Guitar Art’ exhibition runs November 13, 2018 to February 8, 2019 at the University Gallery (400 SW 13th Street, Fine Arts Building B [FAB]). There is a reception Friday, November 16 from 7-9 p.m. featuring the UF School of Music Guitar Ensemble and Alachua Guitar Quartet.